And it worked fine. Based on what is available to read on the web, it looks like the threading model is, in some way, different when using ContinueWith. Although, it would appear that if you specify the TaskScheduler.Current, you should be able to use this in place of await, but that seems to make no difference. 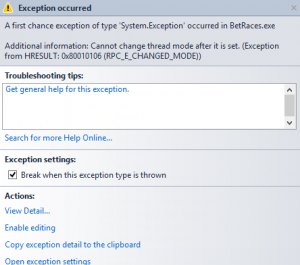 This entry was posted in Async, C#, Monogame, XNA and tagged async, Asynchronous, Cannot change thread mode after it is set, ContinueWith, In App Purchase, Task on July 6, 2015 by pcmichaels. Consumables are a type of in-app purchase that can be used within your app or game; by used, I mean, for example, coin, food, life-force, credit; anything that can be bought and then the same item be bought again. This is opposed to durables, which are in-app purchases, such as removing adverts, premium features, etc. 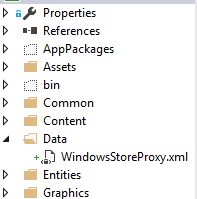 The MSDN article does cover most of what you need. However, it doesn’t seem to cover everything, hence this post. The documentation for the CurrentAppSimulator is also useful. Actual purchasing is done through the CurrentApp class. However, there is an identical test version of this, which simulates the purchasing of in-app products. Part of the store certification process is to ensure you haven’t forgotten to switch these to their live counterparts; although using the #Debug and #Release configurations might be an idea, too (see the bottom of this post for more details on this). If you change the language or currency, you need to be consistent. I left an en-us in and it, point blank, refused to read the document. I spent a while checking the XML was the correct format, and finally just guessed at this. The ConsumableInformation node is commented out. If you put it in, then when you read the license, it will tell you that it is unfulfilled. This is definitely useful for testing, but looks like a bug in your code if you don’t know this. Obviously, this isn’t a requirement; but I would create a class for each consumable purchase. If you have common code then create a helper and base class as well. The following steps are building on the existence of such a class. The idea here is that you can track what has been bought. // Grant the user their content. You will likely increase some kind of gold/coins/some other asset count. App.settings.SaveSettings();  // Ensure that the purchase is saved before reporting it as successful. The reasoning here is that you have started to make a purchase, but the line above `ReportConsumableFulfillmentAsync` has not been called. This then sits in a status which blocks future purchases. Obviously, there is a risk that the code in step 4 will crash just at the point before you report the fulfilment; however, I’d rather that, than the user having paid for something they haven’t received. // To indicate local fulfillment to the Windows Store. // First check for unfulfilled purchases and grant any unfulfilled purchases from an earlier transaction. The above code is what I was referring to in Step 1, when I mentioned the NotFulfilled return status. You can then test possible eventualities. The next step is to enable your purchases in the App Store. The code has to be the same; and for larger games (the producers of which will probably not be reading posts such as this) the codes will be generated on a server, so they can manage special offers, etc. centrally. All you need to do now is to substitute CurrentAppSimulator for CurrentApp. Windows Store Apps automatically compile in Release mode for the store. The links at the start are by far the best resource available for this; but hopefully this will fill in a couple of the gaps that tripped me up. 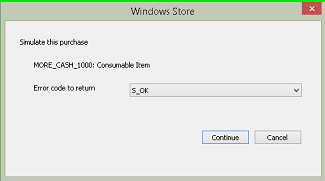 This entry was posted in C#, Game Development, Monogame, Windows Store Apps, WinRT, XNA and tagged Consumable, Consumables, CurrentApp, CurrentAppSimulator, Durables, Games, GetUnfulfilledConsumablesAsync, GrantFeatureLocally, In App Purchase, Monogame, Purchase, Store on June 26, 2015 by pcmichaels. The new async / await syntax in .NET 4.5 + makes asynchronous programming really easy. However, there are times when having an assumption of asynchrony can impede you. One such example is programming for games (see my post on why you might want to avoid this). However, what happens when you want to display a windows message box, or some other action that is asynchronous; See my post on a message box helper for an example. In my particular case, I was to show a message box asynchronously, and perform a certain action based on the result; however, I don’t want to stop the game, and I don’t want to have to introduce an async / await into the programming model (for reasons in the linked post). This will only execute the purchase action if the purchase was successful; it’s completely asynchronous, and it doesn’t affect the main thread. All well and good, but what if, instead of a specific task, we wanted to execute a conditional command; for example: when the purchase is called, we want to turn on a specific feature. The syntax above is nowhere near as clear and concise as a simple await statement; however, await statements can’t be used outside of an async method and, especially when programming games, that’s not always practical. The other thing that I haven’t mentioned here is exception handling – I may make that the subject of a later post. This entry was posted in Async, C#, Game Development, WinRT and tagged Asynchronous, c#, Game Loop, Games, In App Purchase, Synchronous, Windows Store Apps on June 11, 2015 by pcmichaels.